The resurgence of the zombie genre is due for a downslide. The release of this past weekend’s VAMPIRE ACADEMY shows that the recent interest in bloodsuckers is waning. What’s next on the horror docket? The slasher genre came back and went in the 1990s. The werewolf is long overdue for a solid story arc. I, FRANKENSTEIN was a non-starter, so it doesn’t look like we will be dragged back there. Revisiting expressionist horror of the German silent cinema is probably too esoteric to be viable. Instead, we will probably just keep trotting out remakes and reboots and retellings. But I digress. Anyway, I’m here to talk about WORLD WAR Z. So that is what I am going to do. I watched WORLD WAR Z (2013) on 2.15.14. It was my first viewing of the film. Sometimes the story of a film is overshadowed by the story of the making of a film. 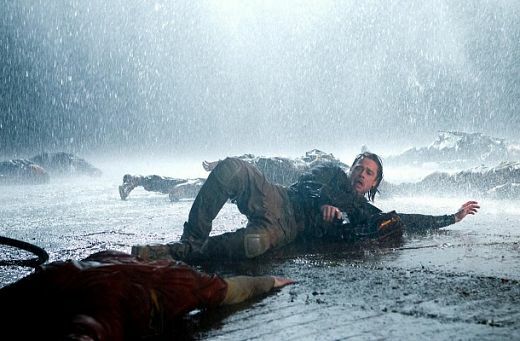 WORLD WAR Z was well known to be in production hell. An entire movie was shot before former LOST producer Damon Lindelof was brought in to take a look. The third act, and it isn’t a spoiler to say this since this resembles the current third act in no way, had a plane landing in Russia, our hero Gerry (Brad Pitt) being forced into the Russian army to fight some zombies, realizing they don’t like cold, and then going back to the US to lead a revolt against the zombies using that knowledge. The storyline of his family, it would seem, was either abandoned or left loose. Lindelof (correctly, it would seem) deemed this a little too pessimistic and cynical an ending. He was hired to rewrite the third act, which he did. Incidentally and ironically, his changes left his LOST hero Matthew Fox with a much smaller role consisting of a handful of lines. But that seems to be getting ahead of the story. 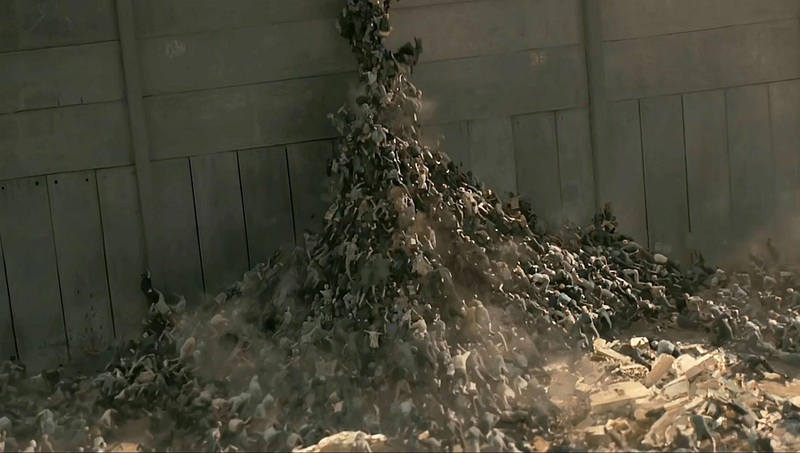 WORLD WAR Z, in its final state, is the story of Gerry being rescued from a worldwide viral outbreak which turns the bitten into zombies. Rather than being rescued for his good looks and cute family, he is instead being pulled back into action by the United Nations to investigate the origins of the outbreak. He agrees only because the alternatie is to be dumped, along with his family, back into mainland hell. By going along with orders, he instead gets his family a nice seat on a navy vessel. The zombies of this film aren’t your daddy’s zombies. Especially if your daddy is George Romero. Instead of slow and moaning, these zombies are the faster, more ravenous, and more desperate zombies we saw in the similarly conceived 28 DAYS LATER. Rather than being derivative of that, however, WORLD WAR Z embraces its title by launching Gerry from Philadelphia, to New Jersey, to South Korea, to Jerusalem, to Wales, and to Canada. This truly is a large scope film which amazingly keeps its focus extremely narrow despite being such a large picture. The strength of WORLD WAR Z is in the way Gerry is single minded in his efforts. He fights and scrapes with the knowledge that his family is waiting for him. The film ups the pressure when he is assumed dead at one point and the family loses its safe haven. This is a thread which goes underused. However, by keeping the story about Gerry’s quest to get to them, and by choosing to avoid a thread of the family fighting to stay alive, the movie has a chance to build real momentum. One payoff which never does come is more confusing, and perhaps a relic of an earlier story. A point it made, early in the film, that 5% of people take much longer than the usual victims to turn once bitten. This seems to lead to inevitable scene when a bitten person is turned at the worst moment after being assumed safe. Yet the movie never goes there. It is hard to decide if this is lazy writing or if it is actually a smart use of false foreshadowing. Perhaps, more likely, I’m just reading too much into it all. The intensity of WORLD WAR Z is legitimate (I have a handprint from my wife’s squeezing to prove it). The story launches almost immediately and we quickly learn that there is no real safe place to be. The navy ships are the one exception, but those on board live in constant fear that they could lose their seat at any moment. Zombies are, of course, the leading killer of people. Yet there are other ways to go too, and the movie has a wonderfully unexpected twist of that sort very early. The moment changes the course of the film, and it truly puts Gerry in a terrible situation. The CGI mostly works, though the scenes in Jerusalem (perhaps because of the brightness of the daylight) makes those effects less convincing than the rest of the film. While the zombies seem to be played mostly by humans in close-up, the long helicopter shots reveal an obvious use of computer imagery. While this is certainly necessary to give that feeling of ants rushing a hill, there is also a disjointing effect by reminding us that these zombies are just ones and zeroes in a computer somewhere. The intensity is momentarily lost. Though, not to worry, the film pulls right back where it needs to be with an airplane sequence of true power. The acting is surprisingly powerful for a zombie flick. Pitt plays this like he is in one of his Oscar films, not an Ocean’s film. He is not light and playful, he is without humor once the action gets moving. His narrow focus drives the film to places it has no right to go. He is a hero who needs protecting; one who is resourceful but not perfect. He is a bodyguard who fails at the most simple job. His heroism is born from a mix of tenacity and luck. Certainly, he is protected from circumstances by a script which allows danger to get uncomfortably close many times. A lesser movie would have these moments feel like coincidence, WORLD WAR Z gives those moments power and weight. This is one of the better zombie films of the 21st century. It’s hard to say where it is on the hierarchy. The scope of it makes the film feel MORE than some of the others, though the claustrophobia of THE CRAZIES and the immediacy of 28 DAYS LATER both provide those films with an argument. Wherever WORLD WAR Z goes on that list is debatable, but it certainly belongs in the conversation. While the talk before the movie’s release was all about the changes they had to make, it would seem that the correct action was taken in making this movie what it is. ~ by johnlink00 on February 16, 2014. Good review. And agreed. This is quite good. I think it could have been even better with some additional focus on character, but the plot and mystery are engaging enough that survives its characterization mistakes. Yeah. They really only focused on one character. Which, in a way, is refreshing. Honestly I don’t think Gerry got much focus either. He is calm, smart and resourceful. Doesn’t have many characteristics beyond that. This one is all plot-based. It still works (I gave it a B), but I think it could have been even with more character to go with the plot. There’s a bit there. We learn that the job made him not so calm. We know about his drive for his family. I felt like I knew who he was much more than, say, Cillian Murphy in 28 Days Later. But I do get what you mean. They didn’t stop very much to give you more. The plot, the spectacle, was certainly the point. The source material itself was awesome, and that’s why it’s such a shame that barely any of it was used here. However, with what this movie did, it was done effectively enough to where I didn’t care too much and I just enjoyed the show. Good review John. And that’s a blind spot I have, not having read the source stuff. God knows I have been pissed at good movies for dropping a favorite book character, so I can’t really begrudge anyone that opinion.